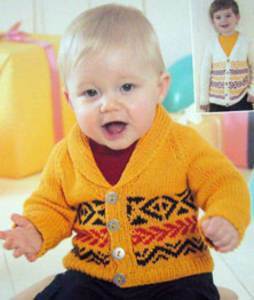 V neck cardigan, main shade: 46-51cm 3 balls, 56cm 4 balls, 61cm 5 balls, 66cm 6 balls. Plus one ball of each of 2 contrast colours. Shawl collar cardigan, main shade: 46cm 3 balls, 51cm 4 balls, 56cm 5 balls, 61cm 6 balls, 66cm 7 balls. Plus one ball of each of 2 contrast colours. Based on 50g balls Sirdar Baby Bamboo, main photo shows shades 174, 127, 173. DK tension 22st/ 28 rows to 10cm, 4mm needles. Also suitable for Sirdar Snuggly DK - quantity will vary. 3.25 and 4mm needles, st holders. Buttons 46-51cm 4, 56-66cm 5.